Vision boards are all the rage these last few years because they allow the creator to dig deep into their hearts and really verbalize what kind of lifestyle they want. Simply thinking about their current lives and what they would like to change is a good start. To get more excited about the vision board process, create a vision board workshop for your tribe of family, friends, local community, coworkers, etc. If those groups are not in the same geographic location (tis the joy of the internet), you can still make it happen. With today’s technology, you can easily create an online vision board workshop in a variety of ways so as to include those near and far. Livestream your workshop. Set up a local vision board workshop in your hometown but also include an online live stream option. You’ll need a high-quality camera and lighting but once you find the perfect spot for your camera setup, you can just set it and forget it. Your online guests can watch live as you explain the process. Some words of advice: Acknowledge your online guests throughout the livestream event. You don’t have to worry about moving the camera but don’t forget you have live viewers. 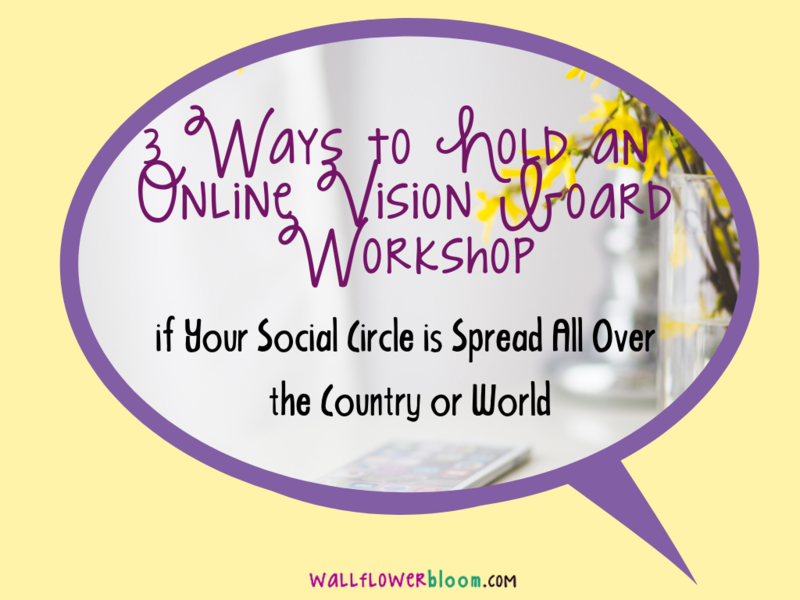 Talk to them and encourage all your participants to submit photos of their vision boards to a private Pinterest board or Dropbox folder to share with the workshop attendees. Use a webinar room. Certainly you’ve been to webinars where the host is on camera and there’s a “room” full of attendees. Depending on the webinar provider and your budget, these platforms can hold anywhere from 50 – 500+ attendees. This format is best suited if you plan to work alongside your guests because you can then demonstrate the steps you’re taking to create your own vision board in real time. With this format, you won’t be able to see your audience’s work during the webinar but they can certainly ask questions and you can encourage them to share their finished products in a private Facebook group or in a separate Pinterest board. A webinar room is also great if you plan to have co-hosts. Maybe partner with other peope who are more versed in vision boards and use the interview-style webinar for added interest. Also use a webinar room to showcase past vision boards to use as inspiration. Use a Zoom room. Zoom.us is an online meeting room with webinar capabilities. The difference with this format is all the attendees will have headshots, either via their video capabilities or with a static photo, shown on the screen. Zoom also has a chat feature so if someone doesn’t want to go on video to ask a question, they can still ask via chat. Be aware that with a free account, each Zoom meeting only runs for 40 minutes, then the meeting ends automatically. If you want to go longer than that – and most workshops run over 90 minutes – check the pricing options and upgrade your account. 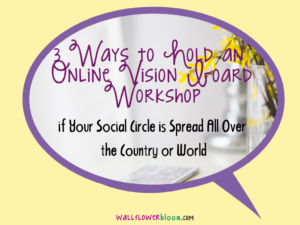 No matter which method you choose to host your worldwide vision board workshop, always check your internet connection, especially if you’re renting a room. Sometimes WiFi connections aren’t quite strong enough and will cut out midway through a livestream, which ends the livestream immediately (same is true with a webinar room). Hardwiring your internet connection is another option that provides a more trustworthy connection. Let your creative juices flow and get creative when planning your vision board workshop. With today’s technology, you’re not limited with how many people you can reach or their geographic location. Get Content, Updates, & Promos! Don't miss what we're announcing soon! 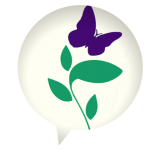 Define your voice + discover your sweet spot! This is a one of a kind course. This has not been done like this before. I know because when I needed it, I couldn't find it ANYWHERE! So I created it!